The cheap candy at the fair is one of Frankie's favorite exhibits. It's about a 1/2 mile long maze of pieces of candy. I thought these nifty fake cigarettes were especially suitable for the kiddies. Didn't see any glock-shaped licorice though. I SO didn't know they made those any more! 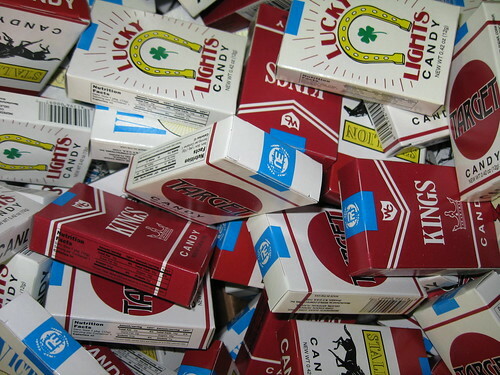 I can still remember how those candy cigarettes taste. I used to love those! About 13 years ago I was in Grandview at one of their little carry-outs. A guy in there gave me a candy cigarette for my son. I was shocked they still made them ... put too polite to say no.